With the weekend fast approaching I thought I would share with you a twisted easel card that I have made for any occasion or as the sentiment states "just because". 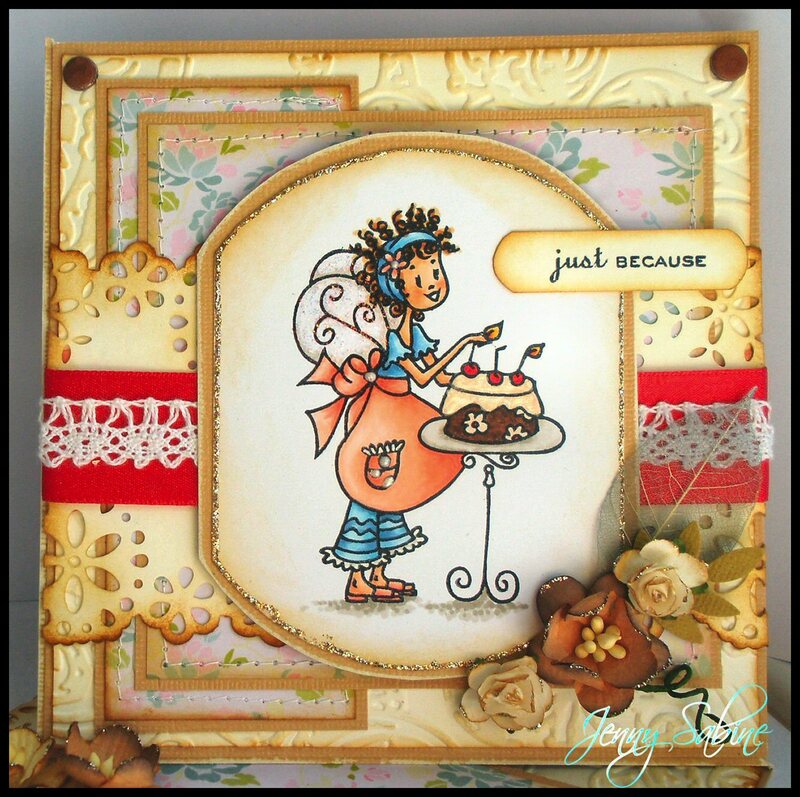 I don't know about you but I never need an occasion to eat cake, especially a yummy chocolate cake with buttercream and cherries on the top as is shown in this cute image by Stamping Bella. If you would like this stamp it can be purchased from Wendy at Stamps & Memories. Click here to go to the website. Band/ Ribbon & Lace - The band has been made from Hammer card, punched with a Martha Stewart punch, distressed with Antique Linen & Walnut Stain. A satin pink ribbon was added and white lace. Finally sparkle was added to the edge of the image and flowers using platinum stickles glue. Thanks for taking the time to stop by and happy crafting. Delicious! There is officially every reason to cake, every day is cake day lol! Gorgeous card and so cute Jenny. A fabulous card Jenny, the layers are fabulous especially with the embossing and great colours too. Thanks for entering the cake challenge at MAWTT and the for joining the Divas for our 'anything goes' challenge. What a lovely card! I love the cheerful colours and the embossing is fabulous. Thanks for joining the embossing challenge at One Stitch at a Time. 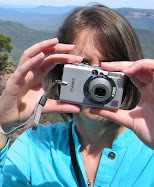 PS I have blog candy at http://berryliciousblog.blogspot.com if you are interested! 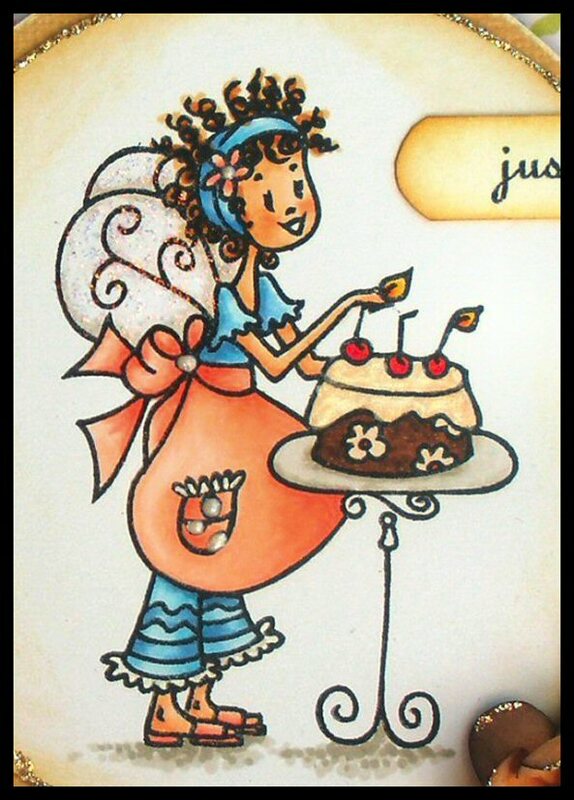 Super cute twisted easel card...one of my fav card styles too! Thanks for joining our 1st challenge at the Emerald Faery Garden!! Aww! 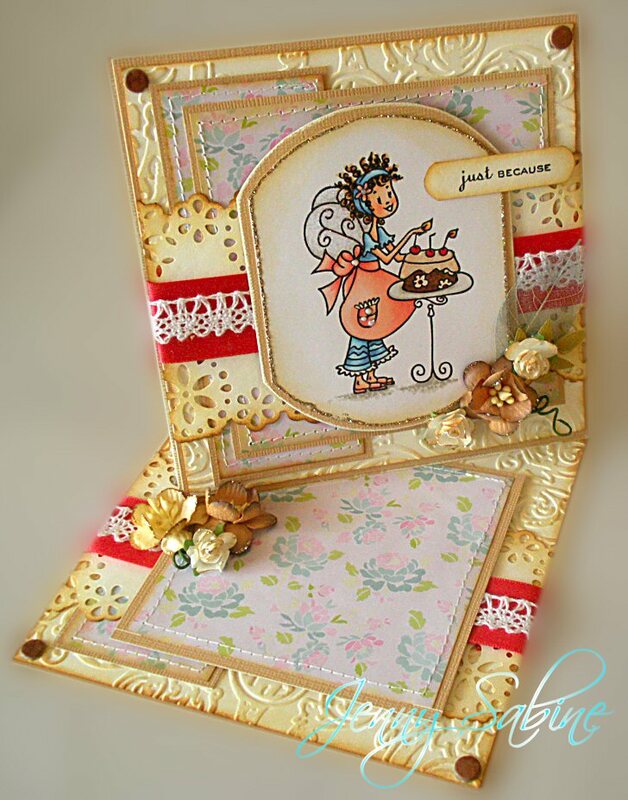 very sweet twisted easel card, thanks for joining in the Emerald Faeries challenge. Great little image, wonderful coloring job and I like the sponging you did on the papers in the background! Thanks for playing along with Divas by Design this round! Love your amazing design and your colours and details are wonderful! WOW WOW WOW, absolutely Stunning Card Jenny!!!! Thanks for playing with us at The Emerald Faeries Garden Challenge.